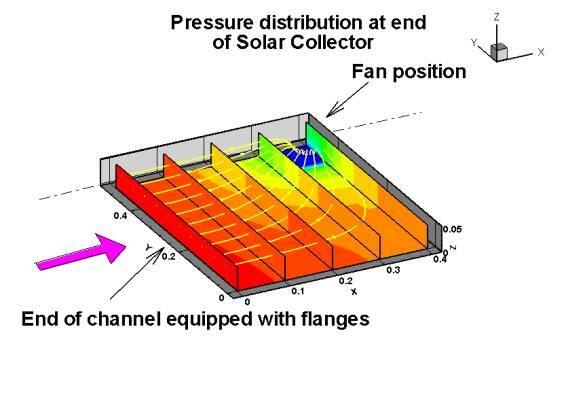 Expose the upper side to incoming heat from the sun and then cover the end of the flanges you get many boxes. 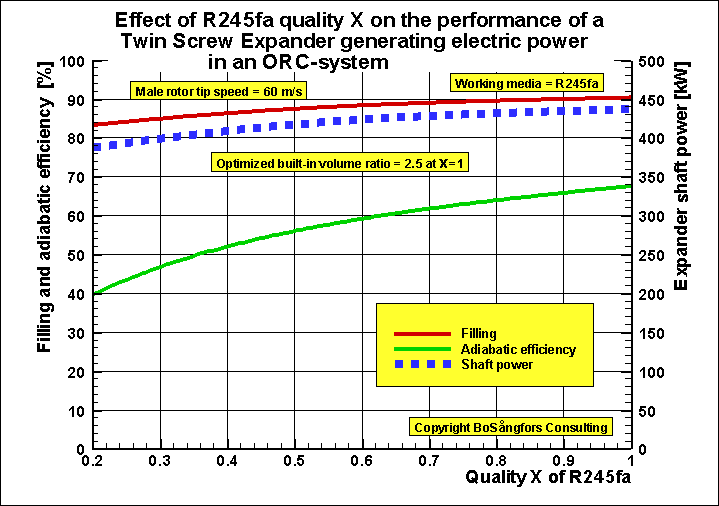 In order to give some feeling about the effects of different working media on the performance of a twin screw expander with the diameter 285 mm these calculations are presented. As is shown the choice of working media is very important and determines the size of the screw expander. The expander is a dry screw expander with synchronizing bearings. These temperatures are valid for all calculations. Pump losses in ORC system are included. Brine pump losses are not included. 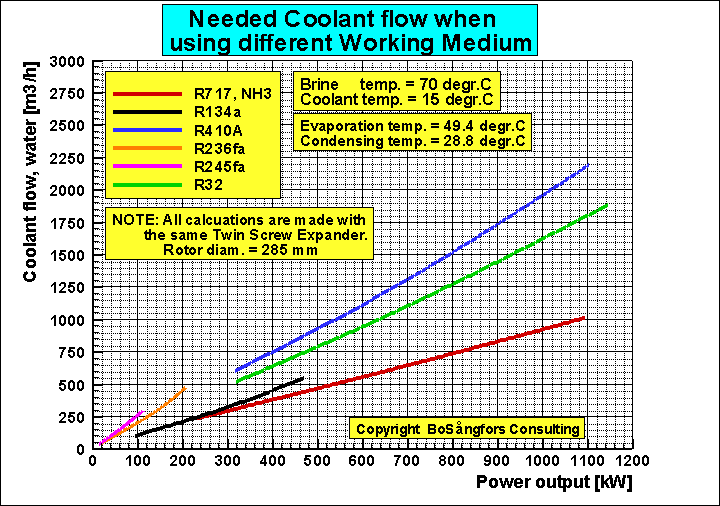 Coolant pump losses are included. 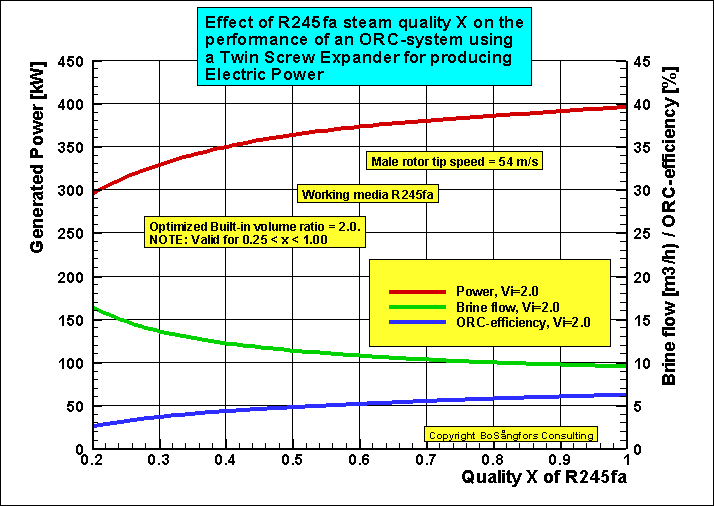 Of interest is that the shaft power for R32 is higher than for Ammonia. 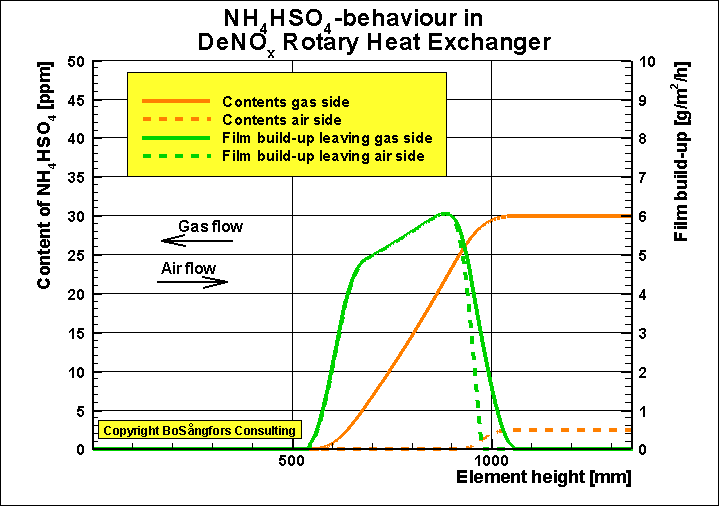 On the other hand the generated electrical power is higher for Ammonia than for R32. The main reason for this is that the media pumping power is higher for R32 than for Ammonia. 685 kW for R32 and 84 kW for Ammonia. Change the working medium in stage 2 from R134a to R245fa. to get the same performance. Why not use a turbine instead, since the expansion takes place in the superheated region? Now I changed the second stage from Screw Expander to a R245faTurbine. The performance is the same, but the turbine is a smaller machine than a Screw Expander. is an interesting example for the second stage. Can be found on Research Gate. 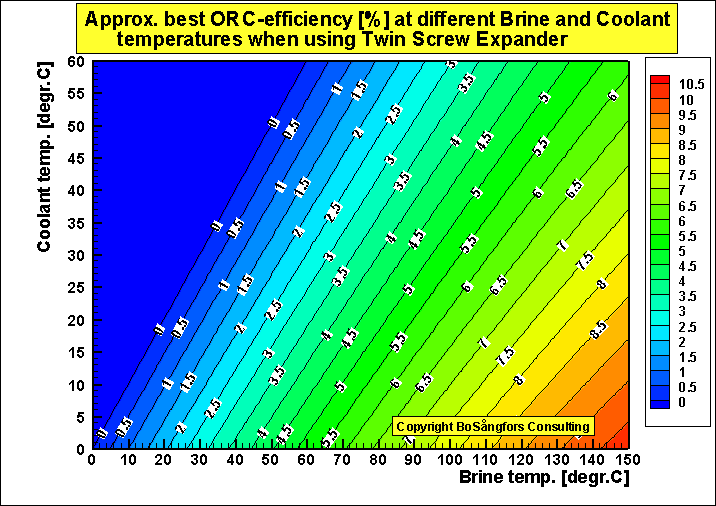 The two screw expanders in this system are dry expanders of the same size, namely diam. = 285mm. 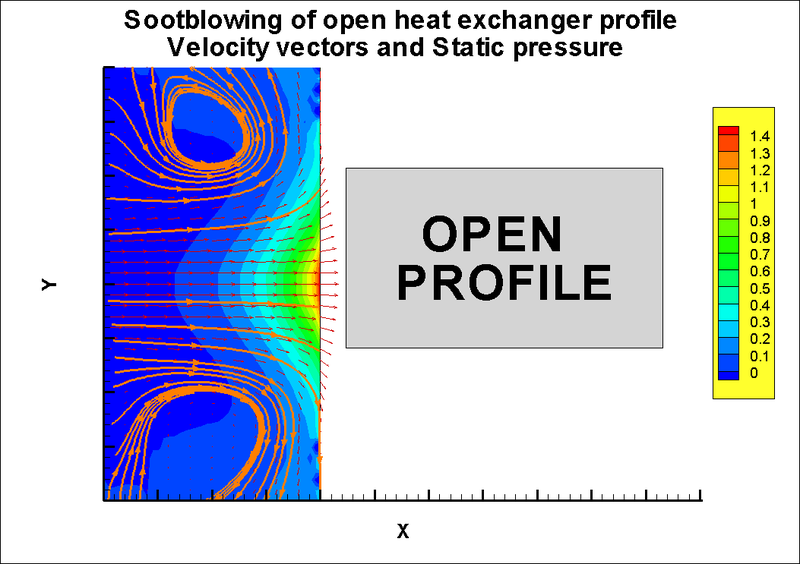 Fig.1 shows the generated effect as a function of the steam flow entering the system. 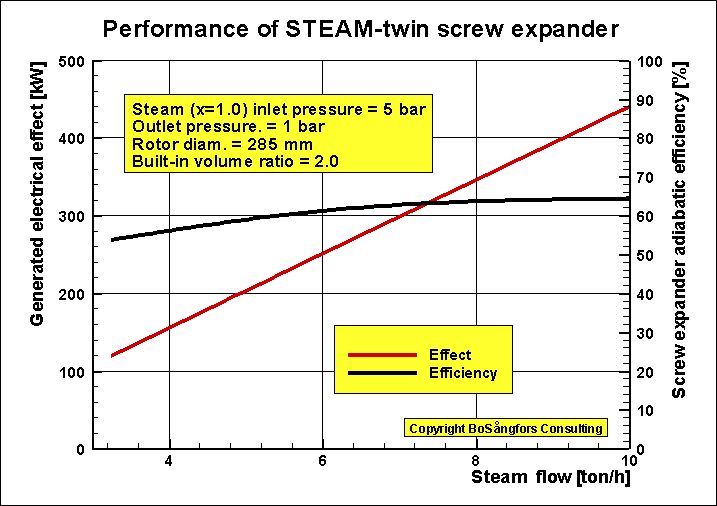 Fig.2 shows that the generated effect and the adiabatic efficiency as a function of the steam flow leaving the steam expander. 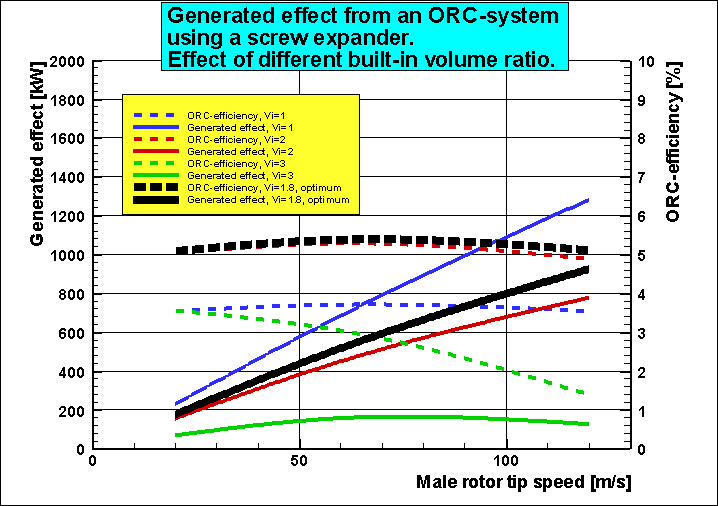 Fig 3 shows generated power and ORC-efficiency. 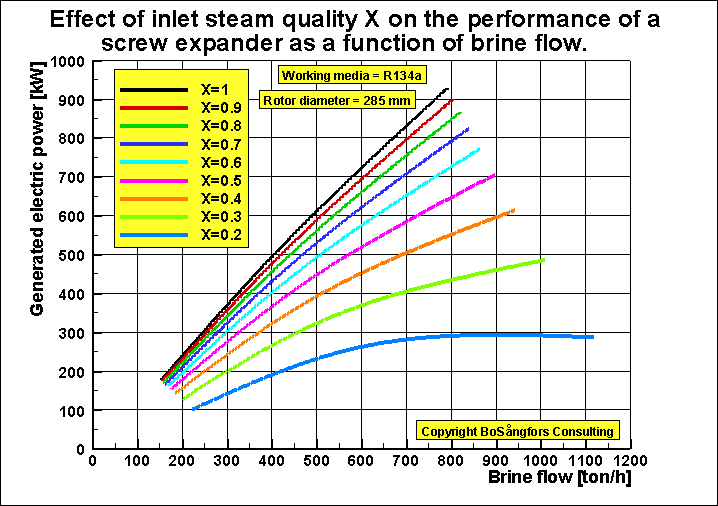 Importance of having good steam quality x at the inlet of a Steam Screw Expander generating electric power. 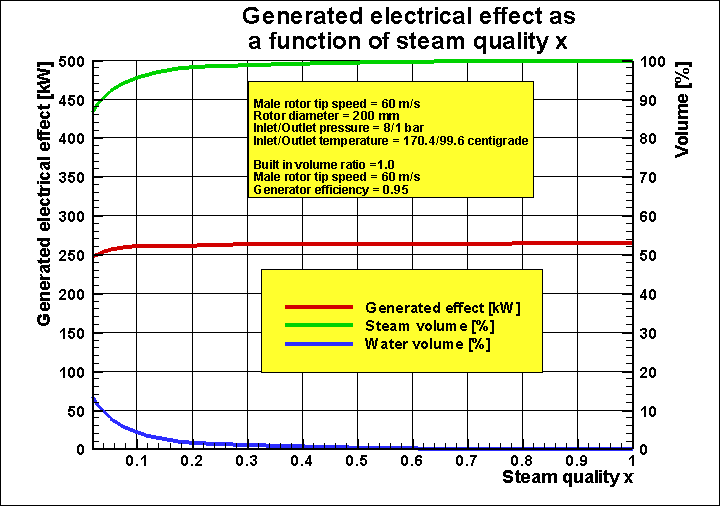 From fig 1 it can be seen that the generated effect is approximately the same for steam quality x > 0.2. 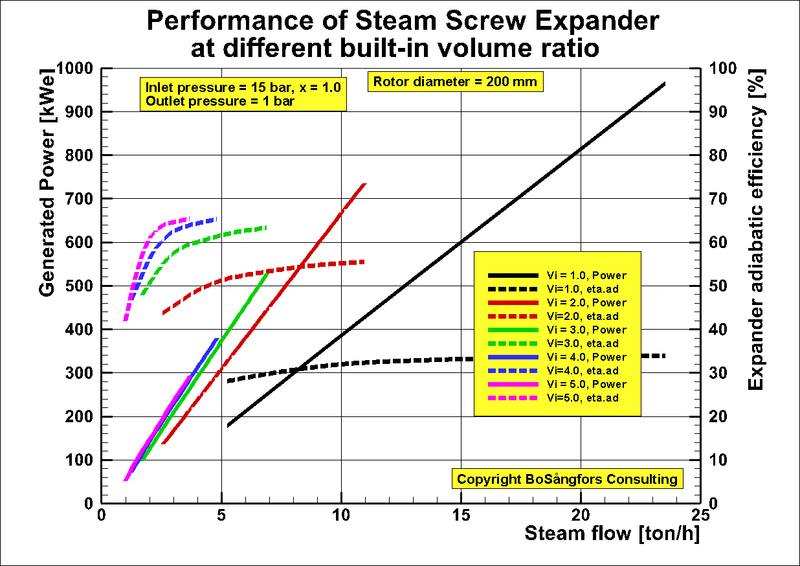 It is also interesting to see that for x > 0.2 most of the volume in the screw expander is filled with pure steam, which explains the almost constant generated effect. The water volume is very small. Built in volume ratio =1.0. 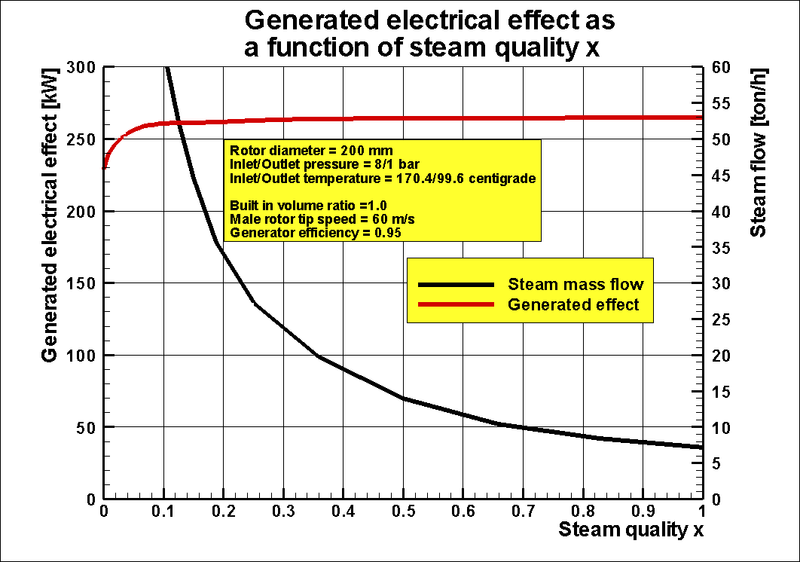 This looks very nice, but a look at fig.2 below shows that the steam consumption is very dependent of the steam quality x. 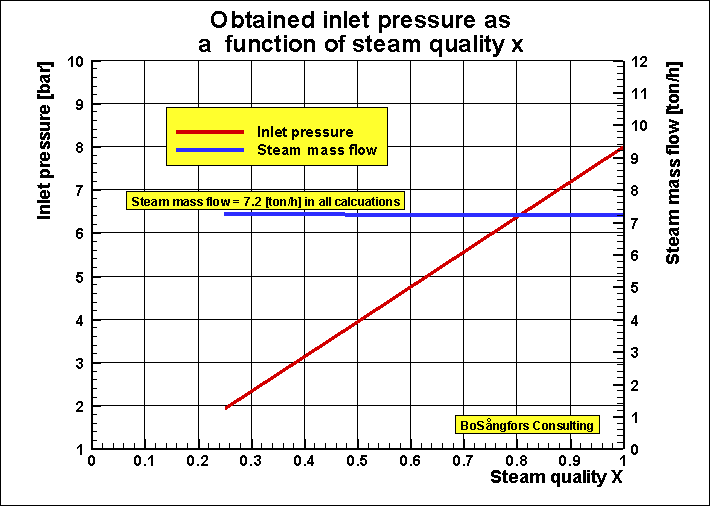 For example if you decrease the steam quality from 1 to 0.5 the steam mass flow increases twice. 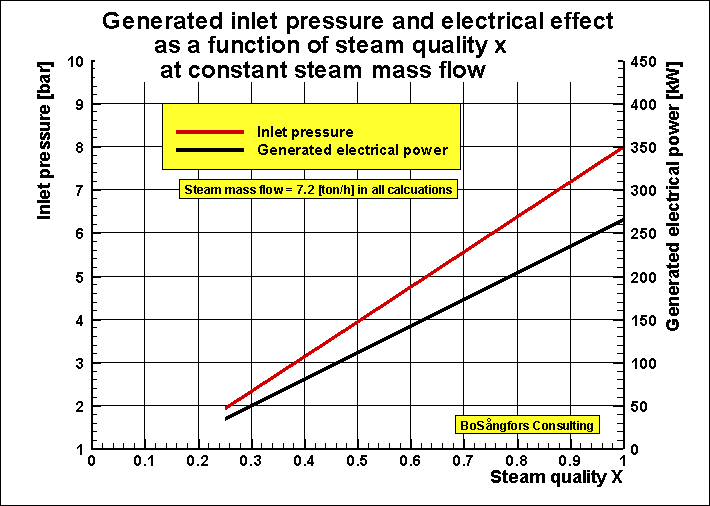 Effect of inlet steam quality X if the inlet steam mass flow is constant. 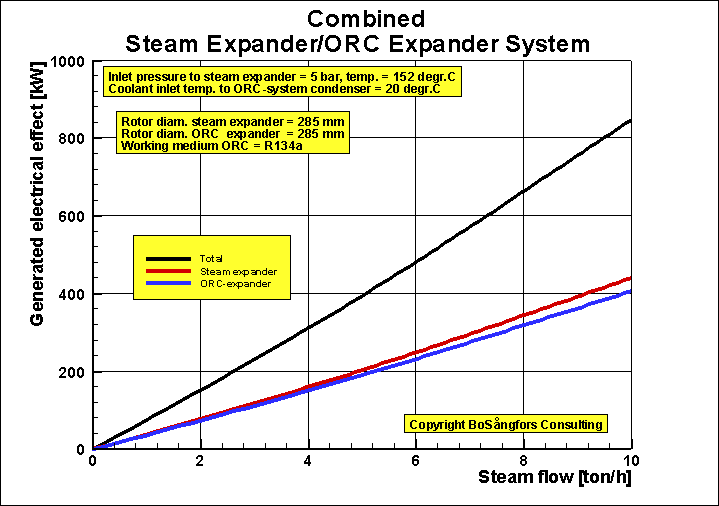 In these calculations the steam mass flow is kept constant by changing the inlet pressure and temperature. As can be seen the generated power as well as the inlet pressure decreases with decreasing inlet steam quality. 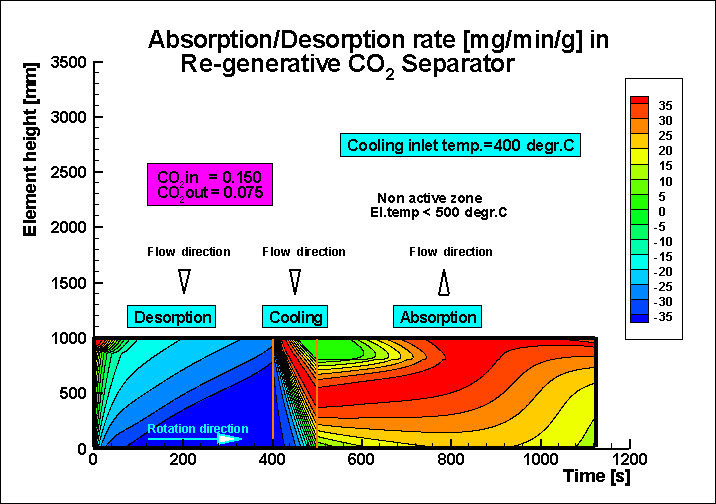 Inlet steam mass flow = 7.2 ton/h in all calculations. 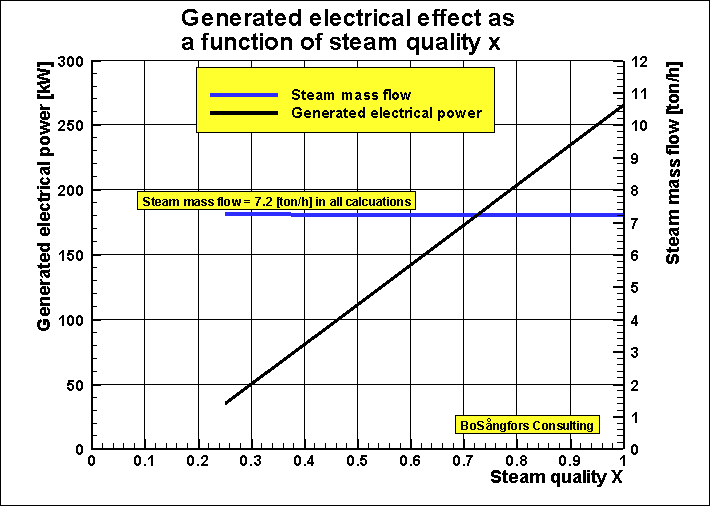 Fig.1 shows that the generated effect decreases with decreasing steam quality. 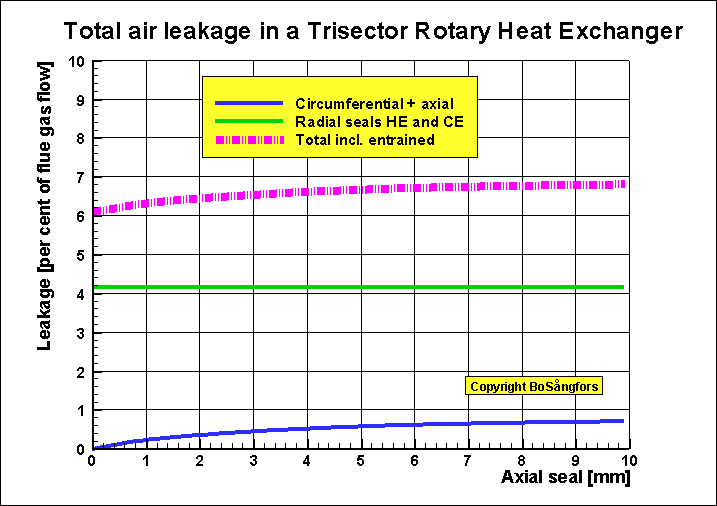 This is due to the decrease in inlet pressure, See fig.2. Fig. 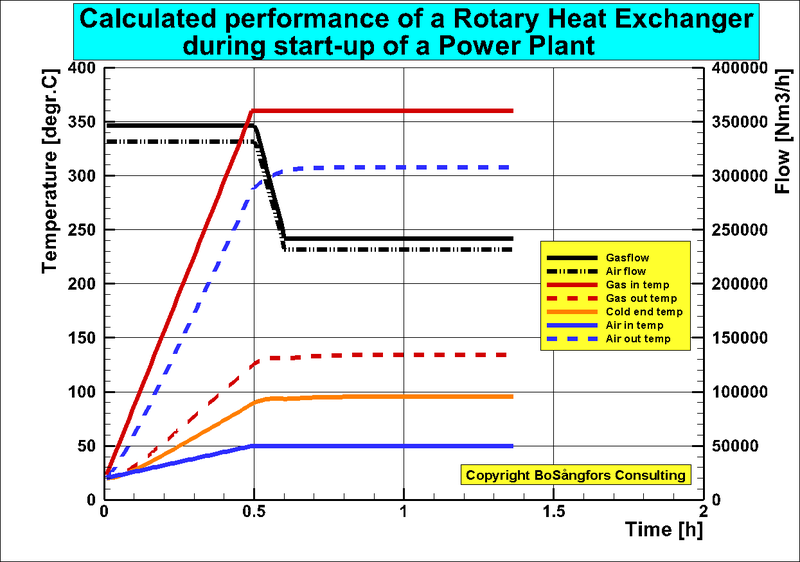 3 shows the decrease of inlet pressure and generated electric power. 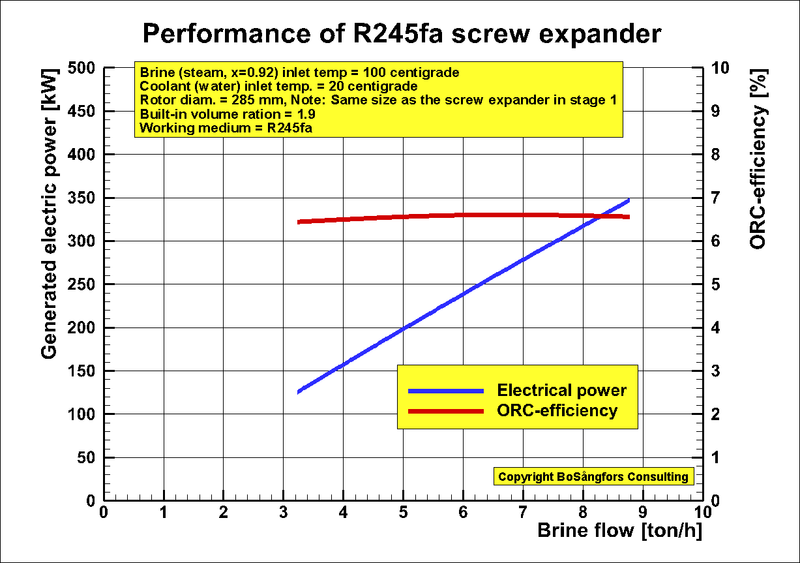 Increased brine flow and decreased output of electrical power due to decreased R245fa steam quality x from an ORC-system using a Twin Screw Expander. 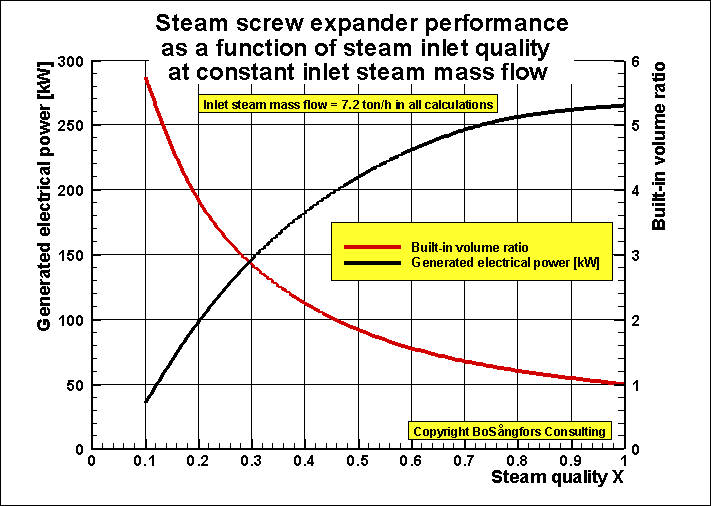 This graph is just to show the importance of having a good steam quality at the screw expander inlet. One can say that this is typical for all displacement machines - not only screw expanders. 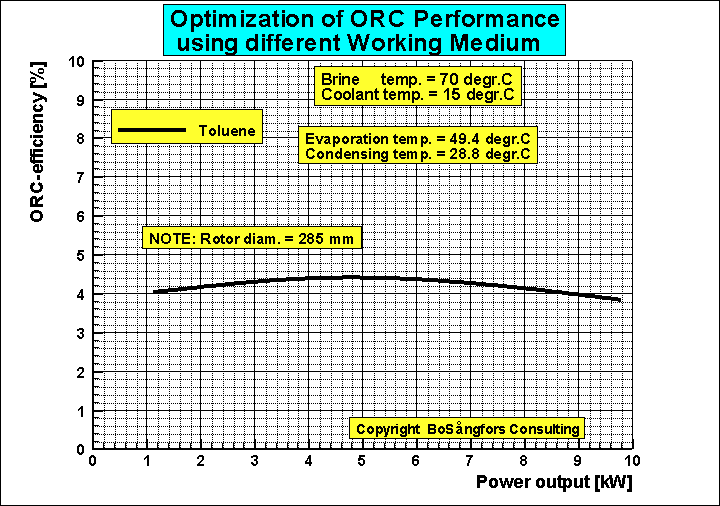 Fig 1 shows the generated power and ORC-efficiency. 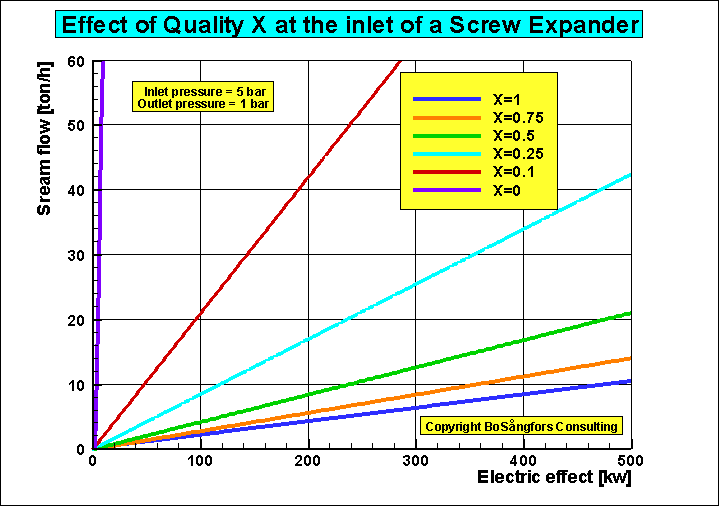 As you can see all these parameters decrease when the quality X at the expander inlet decreases. As is obvious it is important to have a good quality x at the expander inlet. 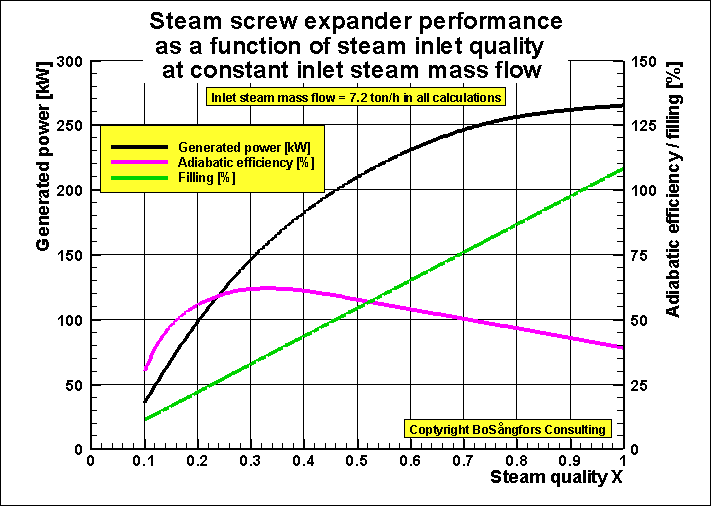 New version of Effect of inlet steam quality X if the inlet steam mass flow is constant. In these calculations the steam mass flow is kept constant by changing the built-in volume ratio. 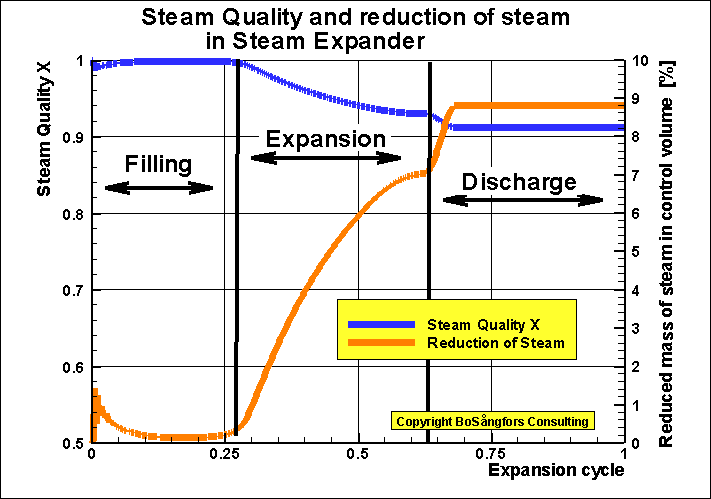 Fig.1 shows that the generated effect and the filling decreases with decreasing steam quality. The adiabatic efficiency is maximum at x=0.3. 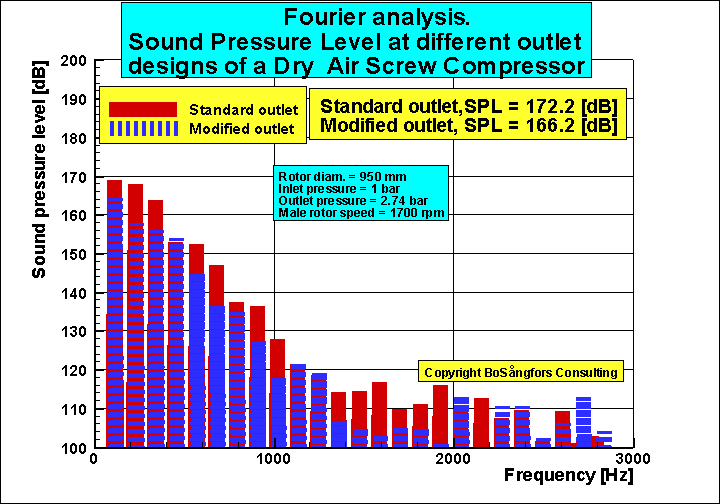 Fig 1 shows the pressure drop across the screw expander inlet port during the filling phase. 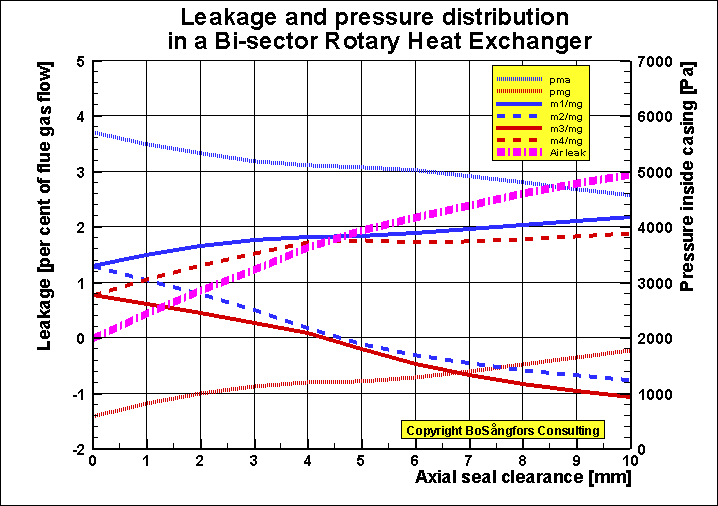 As is obvious the pressure drop is high at the opening and the closing of the inlet port due to the small areas. 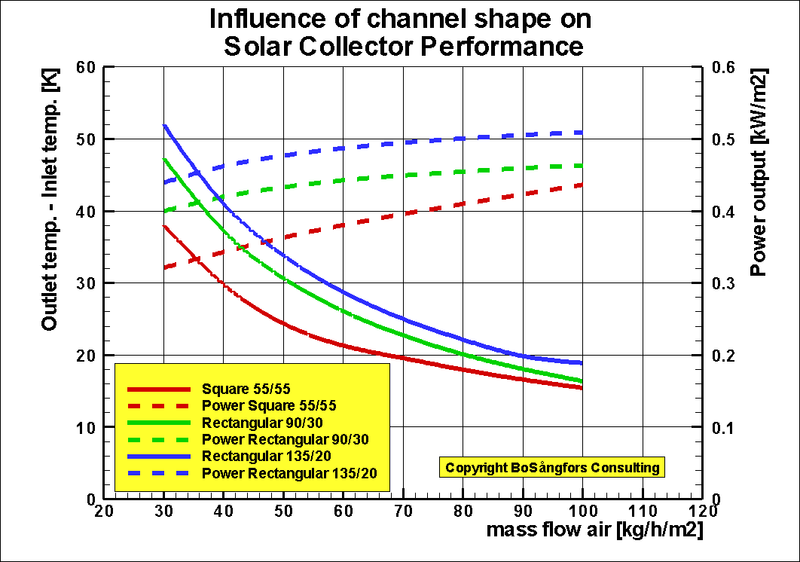 Fig 2 shows the shaft power as well as the filling and the adiabatic efficiency. 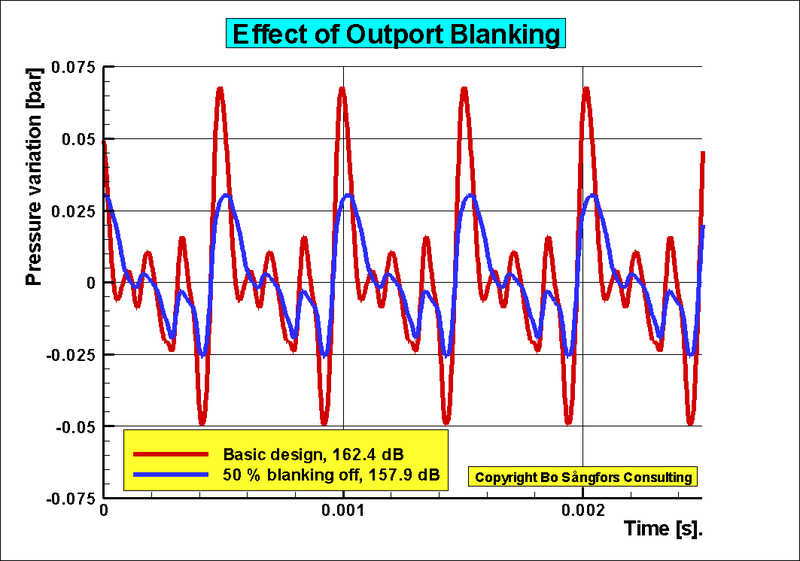 As you can see all these parameters decrease when the quality X at the expander inlet decreases. 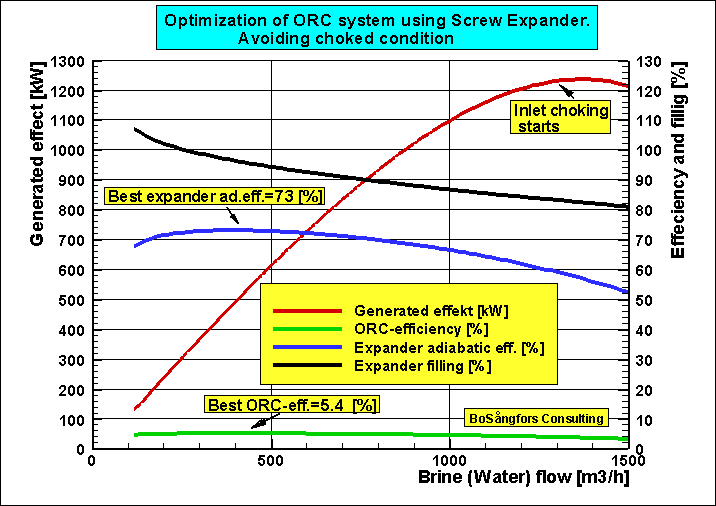 Fig 3 shows the generated power in an ORC-systemas well as the filling and the ORC-efficiency. 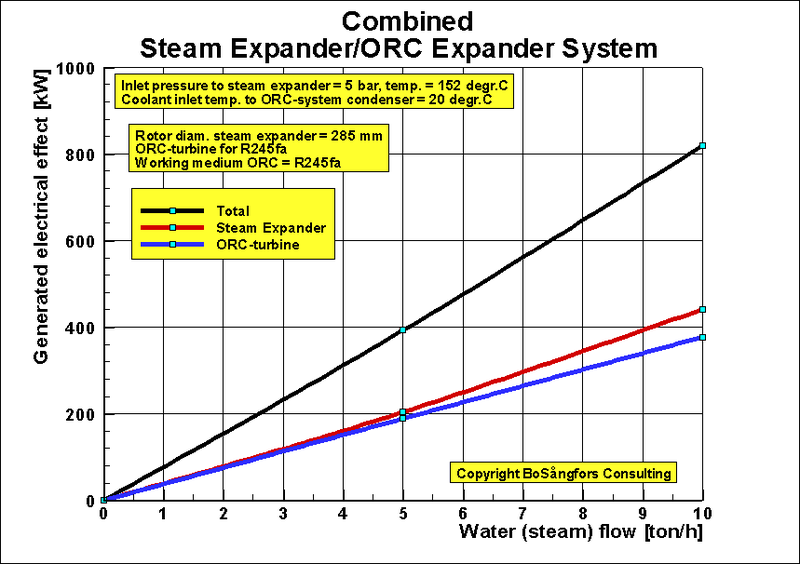 In order to give more information about the effects of various steam quality X, when using a screw expander in an ORC-system these calculations are presented. 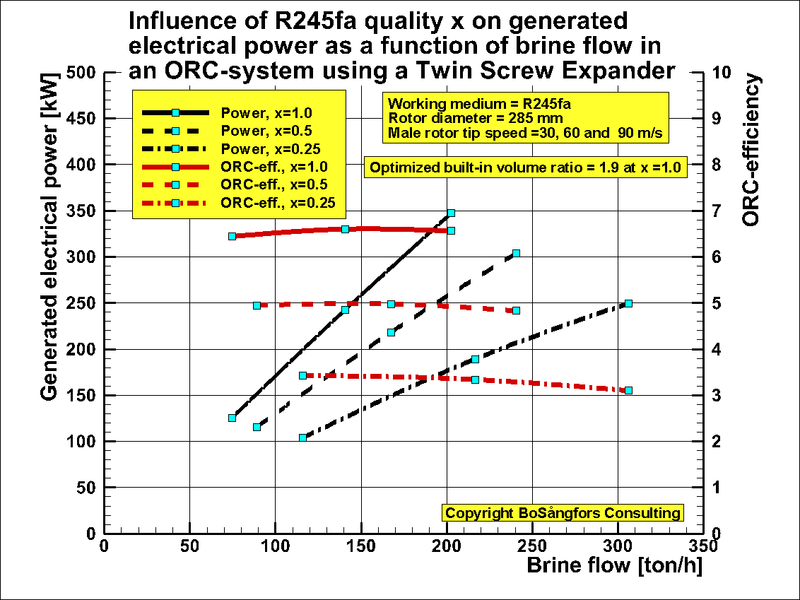 This data set presents 2 graphs, where fig.1 shows the performance as a function of the male rotor tip speed and fig.2 the performance as a function of the brine flow. These temperatures are valid for all presented calculations. As can be seen from fig. 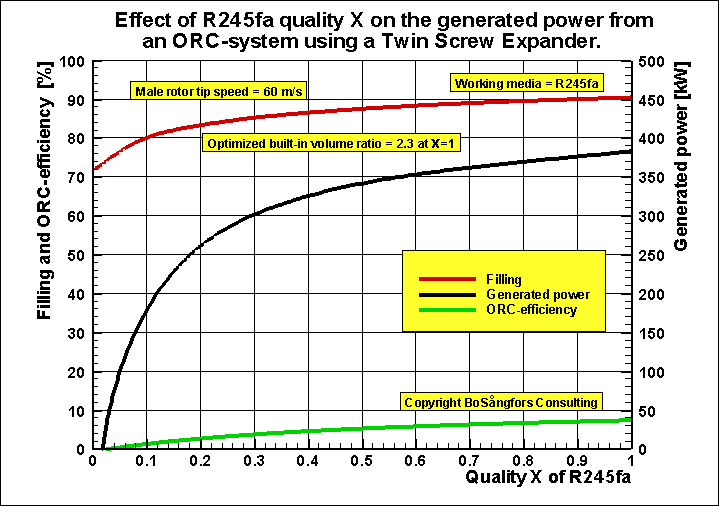 1 and 2 the generated power decreases with decreasing quality X. 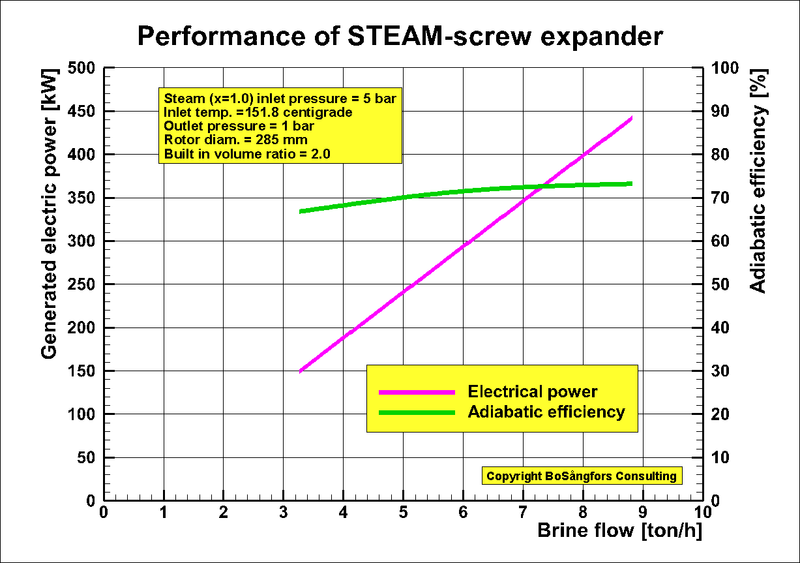 This graph shows how the different built-in volume ratio effects the generated electric power and the screw expander adiabatic efficiency. The rotor tip speeds are from 20 m/s up to 110 m/s. As can be seen low built-in volume ratio leads to high power output but to low adiabatic efficiency. 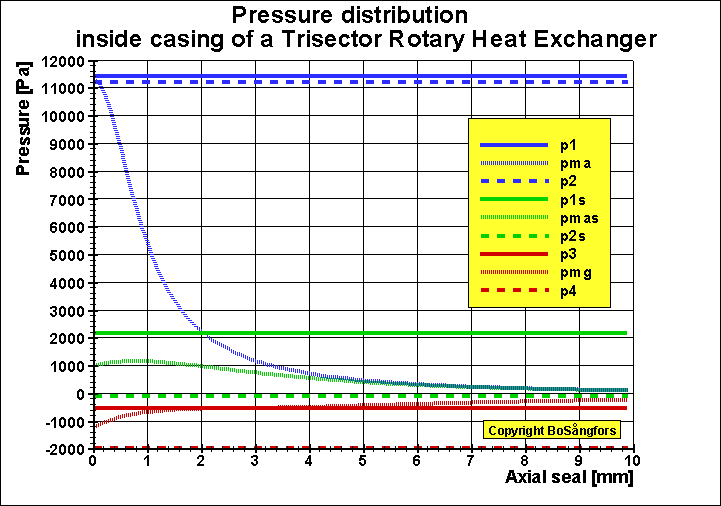 The graph below is for inlet pressure 8 bar and outlet pressure 1.5 bar. As can be seen in this example there is a built-in volume ratio point that gives the best adiabatic efficiency. Another point of interest is that Vi=3.0 and Vi=4.0 are quite close in performance. which uses a helical screw expander for driving a generator producing electrical power. 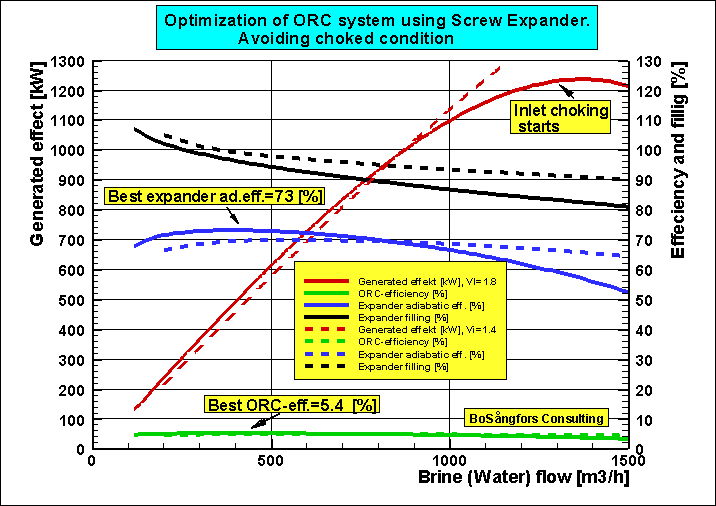 In order to give more information about the effects of various built-in volume ratio Vi, when using a screw expander in an ORC-system these calculations are presented. As can be seen from fig. 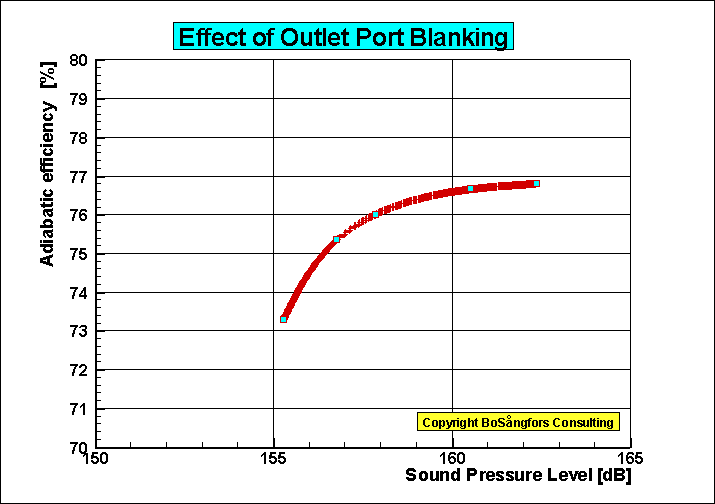 1 the built-in volume ratio = 1 gives the highest production of power, but the ORC-efficiency is not so high. At Vi=2 the produced power is lower, but now the efficiency has increased and is very close to the optimized Vi=1.8. 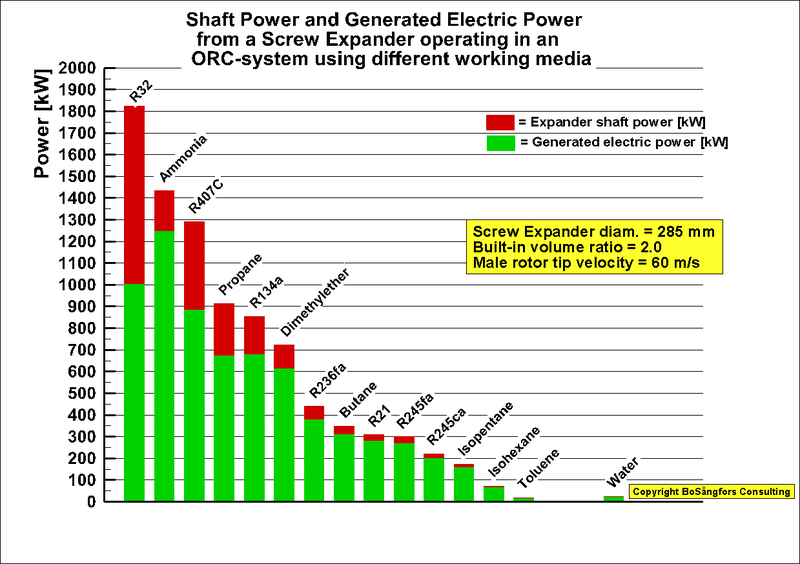 At Vi=3 the produced power begins to decrease after male rotor tip speed = 80 m/s. Please note that the ORC-efficiency decreases when the tip speed increases. This is due to the increased pressure drop at the expander inlet. As can be seen from fig.2 the operational range is strongly reduced when Vi is increased. 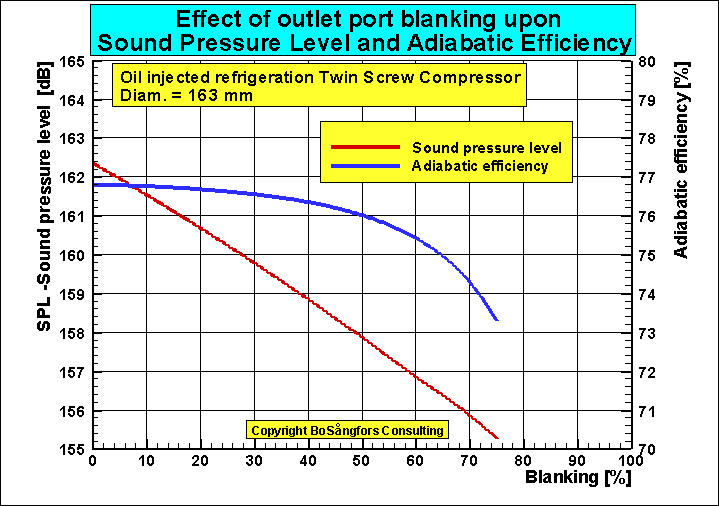 For Vi = 3 the pressure drop loss at the inlet is so high that the operational range is extremely reduced. 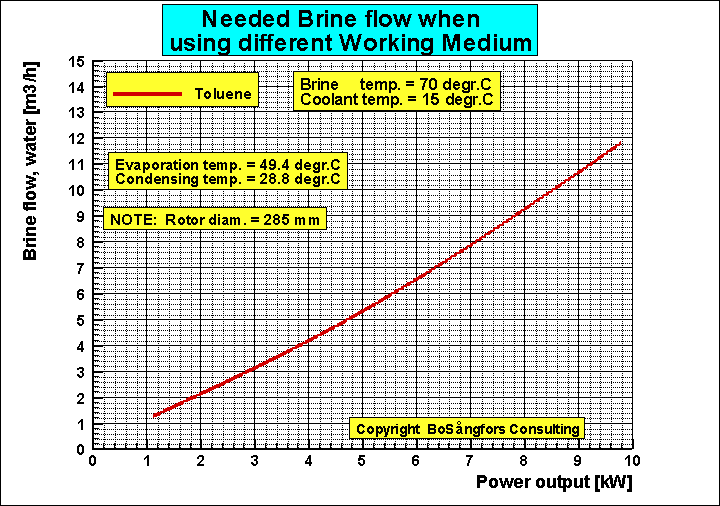 At brine flow above 250 m3/h the generated effect starts to decrease. a screw expander for driving a generator producing electrical power. 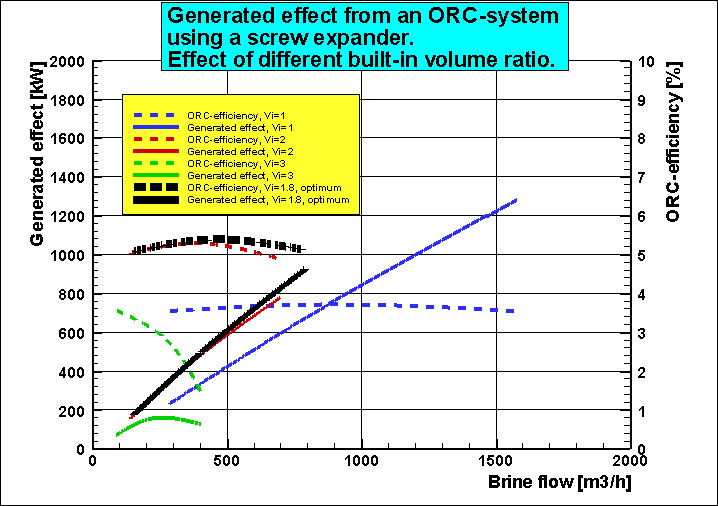 In order to give more information about the effects of various built-in volume ratio Vi, when using a screw expander in an ORC-system these calculations are also presented. 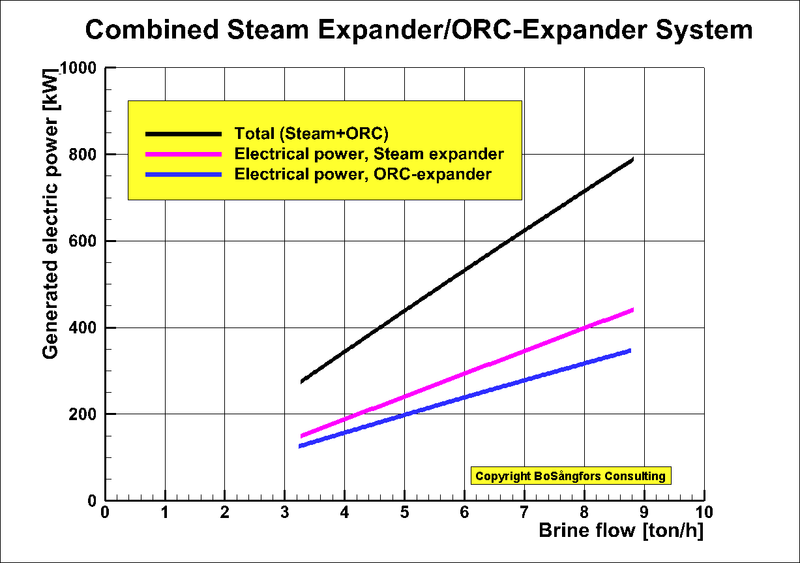 The presented graph shows the generated power and the ORC-efficiency a function of the brine flow. 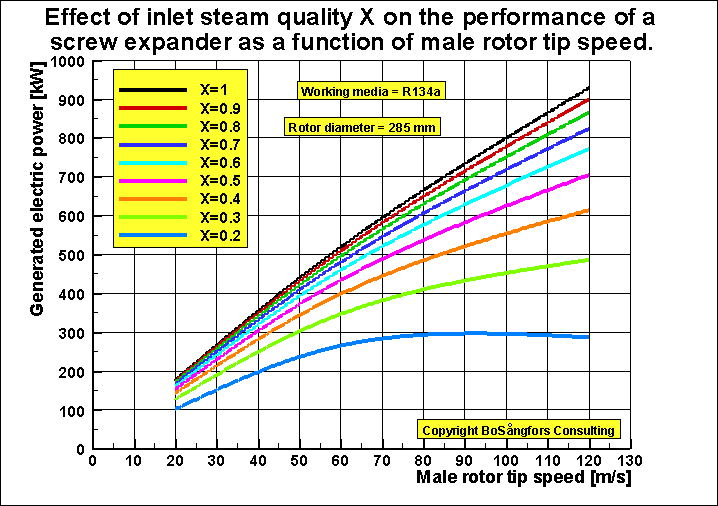 Male rotor tip speed is from 30 m/s up to 110 m/s. 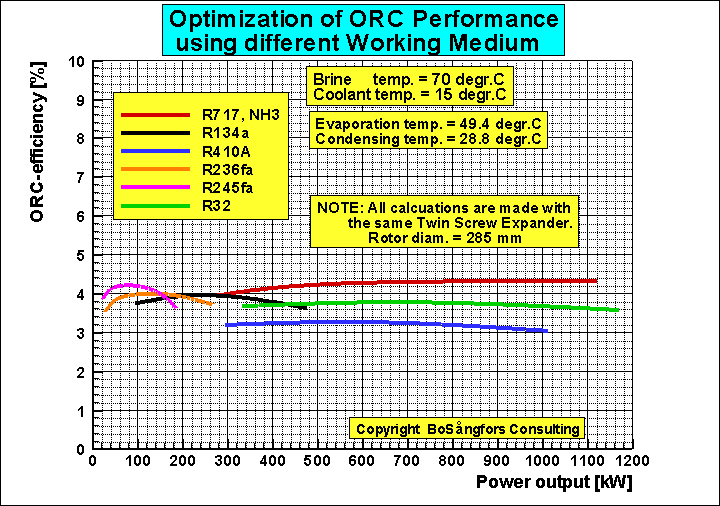 As can be seen from the graph the built-in volume ration Vi = 1 gives the highest production of power but the ORC-efficiency is not so high. At Vi =2 the produced power is lower, but now the ORC-efficiency has incrreased. 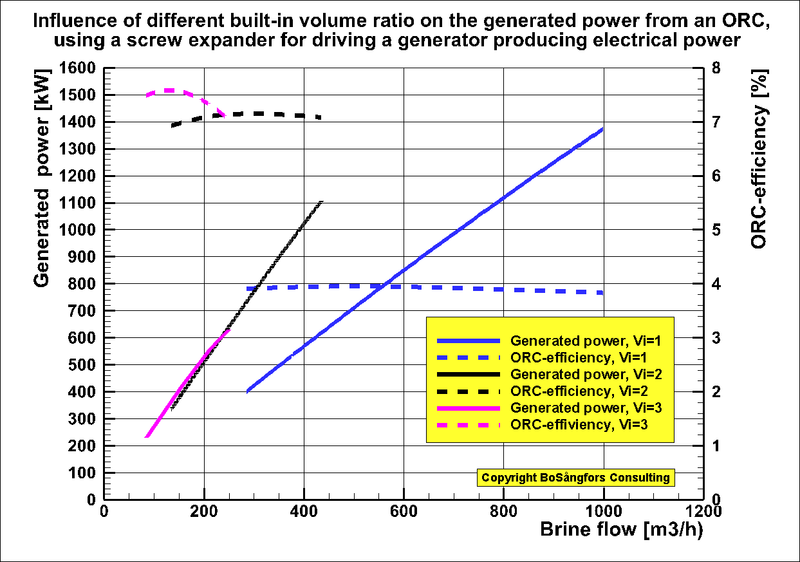 At Vi =3 the produced power is even more low and the ORC-efficiencyis as high as 7.6 % at 22 m3/h brine flow. The operational range is strongly reduced when Vi is reduced. This picture shows the effect of using saturated steam instead of water. As can be seen the use of saturated steam is much more efficient than the use of water. 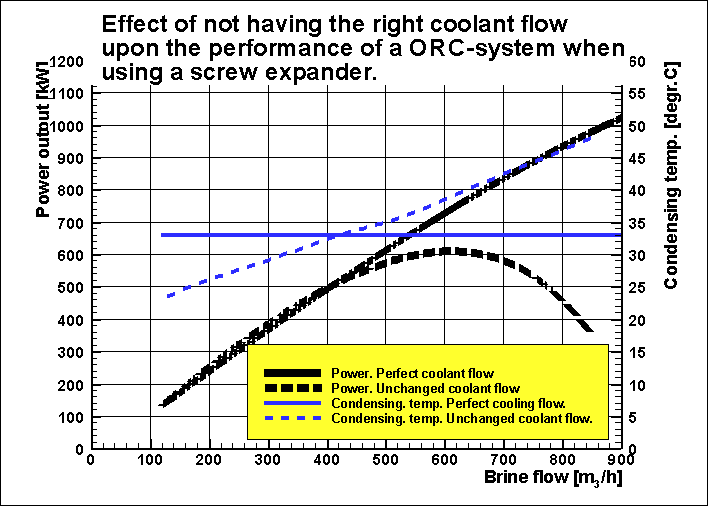 Effect of not having the right coolant flow upon the performance of an ORC-system when using a screw expander. 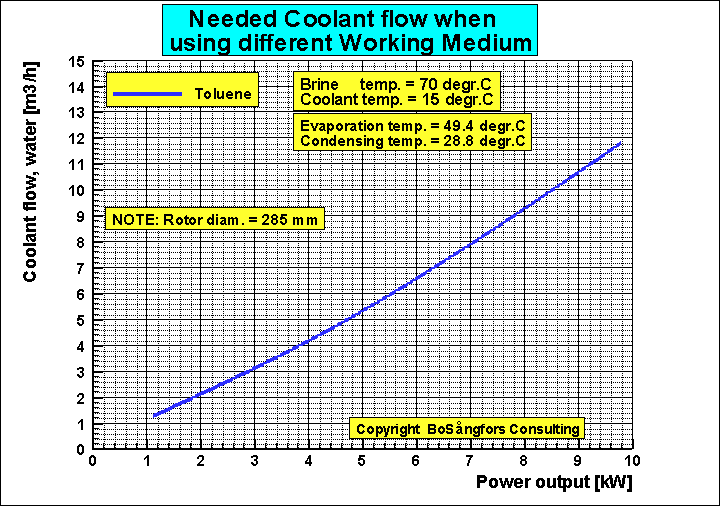 Fig 1 and 2 show what happens if you change the brine flow but have the coolant flow constant. 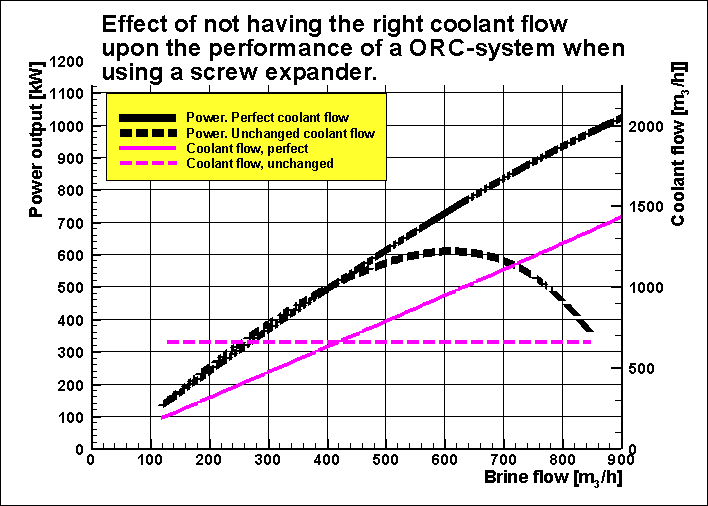 As is obvious it is important to have enough coolant flow if you want an efficient ORC performance. Brine flow : See fig 1 and fig 2. This value of the condensing temp. is valid for the perfect condition. 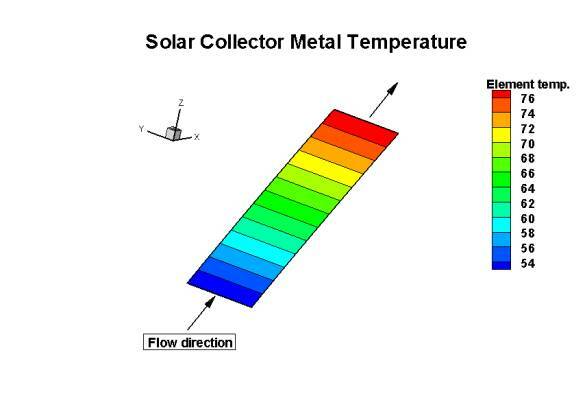 At constant cooling flow see fig 2. As can be seen it is very important to have a good steam quality. I.e. = 1. Therefore slight superheating is recommended. For instance if X=0.5 instead of 1, the steam consumption will increase with a factor 2. I.e.the machine acts as if 50% of the flow is by-passed. 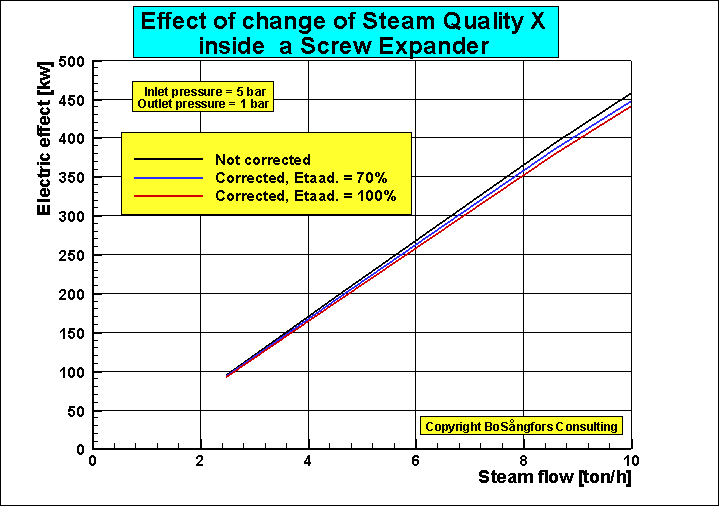 Fig 1 shows what happens if you change the steam quality x at the inlet of the screw expander. 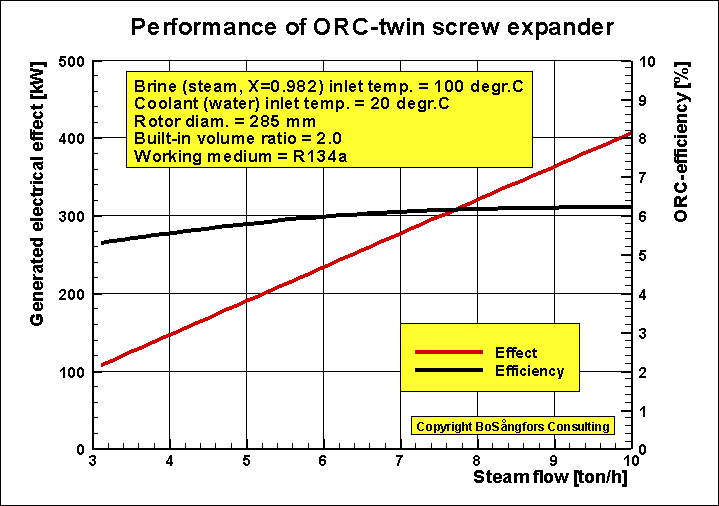 As you can see the generated power as well as the ORC-efficiency decreases as x decreases, but the brine flow increases. 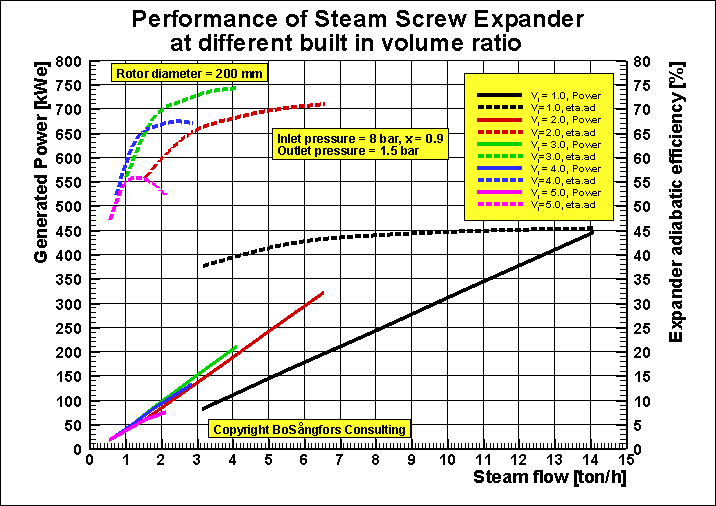 In order to find out the effect of the variation of Steam Quality in a screw expander this investigation was made.It is assumed that the change is immediate. I.e. no time factor is taken into consideration, which means that the presented effect is maximum. The values for the steam quality are taken from the program Refprop. Steam flow = 8 ton/h. As can be seen it is very important to have a good design point. 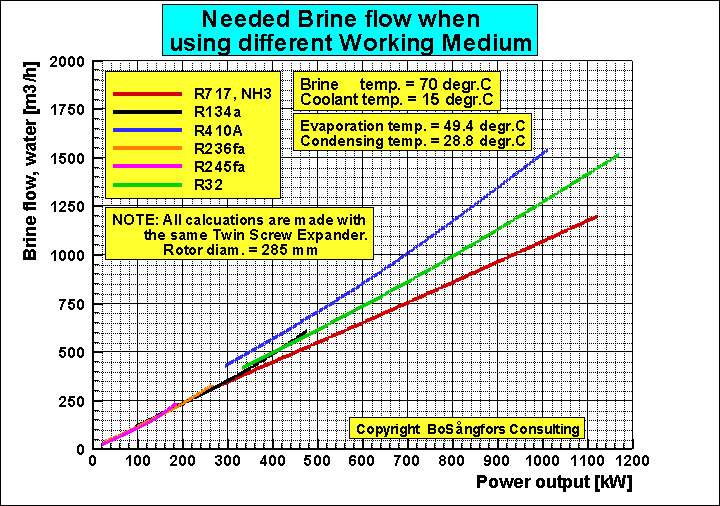 Too high brine flow leads to inlet choking at 1350 m3/h. The best ORC-efficiency is for this screw expander at 400 m3/h. Results from discussions with Elvedin Mujic, City University London. Closing of inlet port = 375 degr. Injection of oil = 395 degr. Opening of discharge port = 635 degr. “Computer Simulation of the Oil Injected Twin Screw Compressor”. Opening of discharge port = 593 degr. 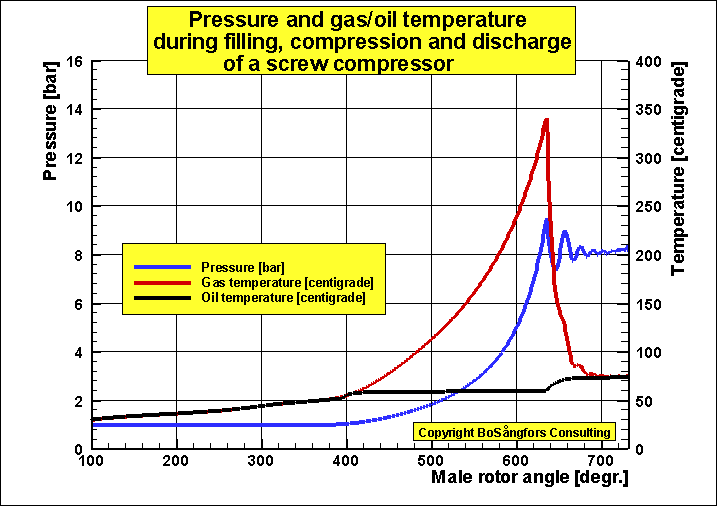 A comparison of this graph with the above for an oil injected air screw compressor shows that the temperature behaviour is different. An explanation for this is that the physical data for R134a and oil are in the same size order for the calculations of the refrigeration compressor. 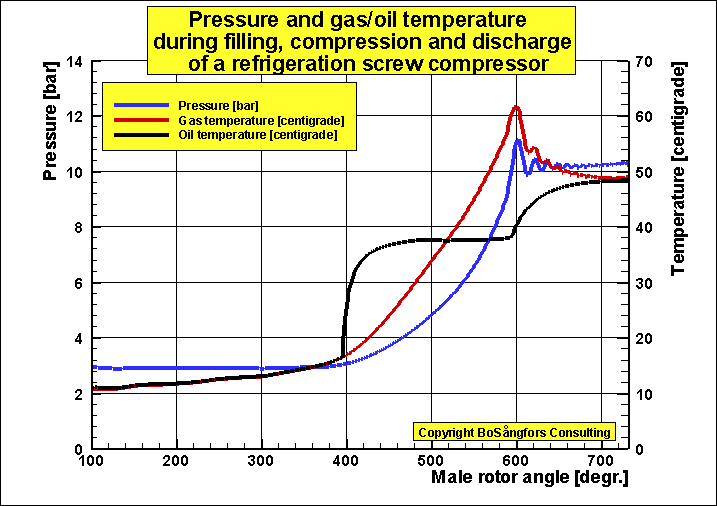 In the dataset “Pressure and gas/oil temperatures during, filling, compression and discharge of a screw compressor” the gas is air, which have physical data very different from the injected oil. 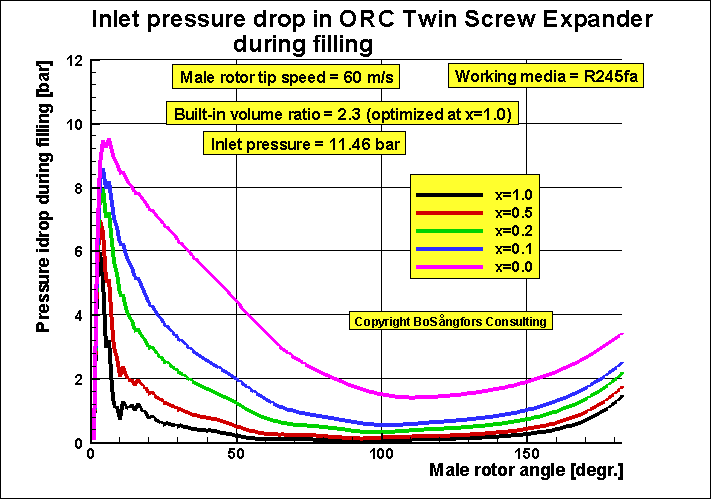 Leakage analysis of a Twin Screw Compressor. 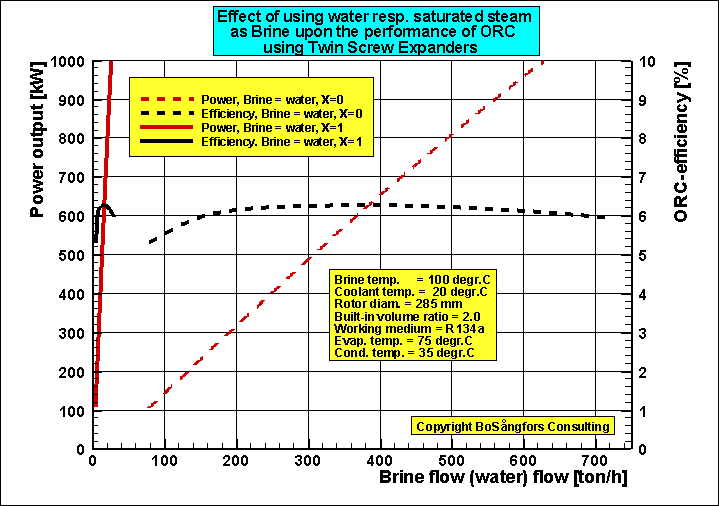 Leakage analysis of a Twin Screw Expander. 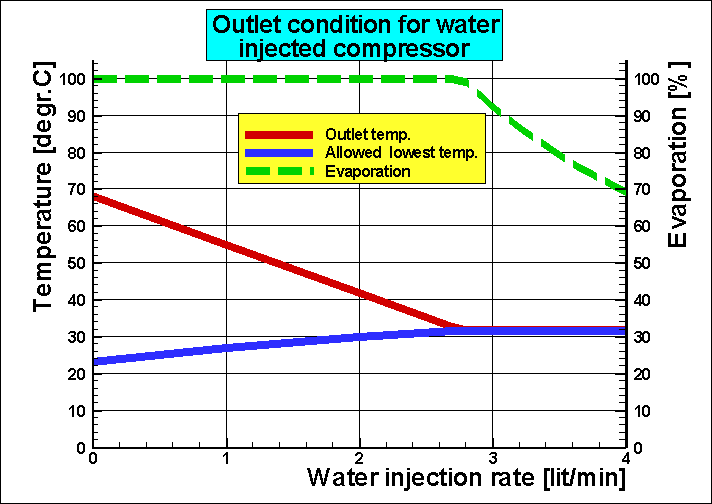 "Numerical calculation of effects from injection of different liquids in twin screw compressors”, VDI 1998.
and 37 lit/min to the 1st stage gives reduced power consumption. 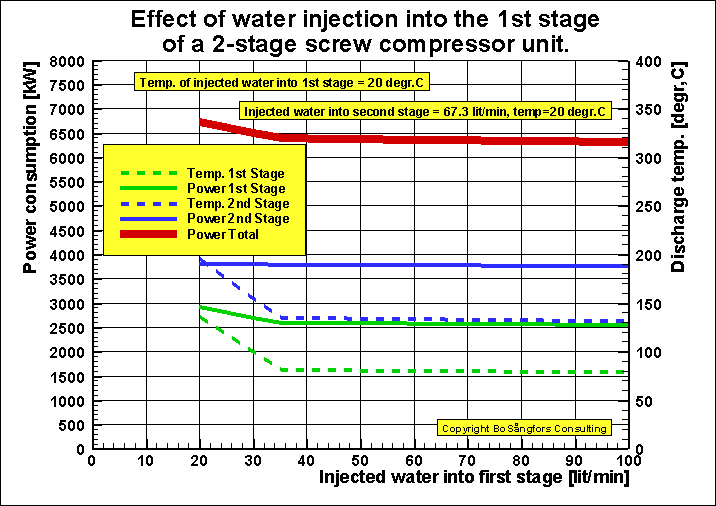 Further increase of the 1st stage water injection rate does not improve the performance very much. 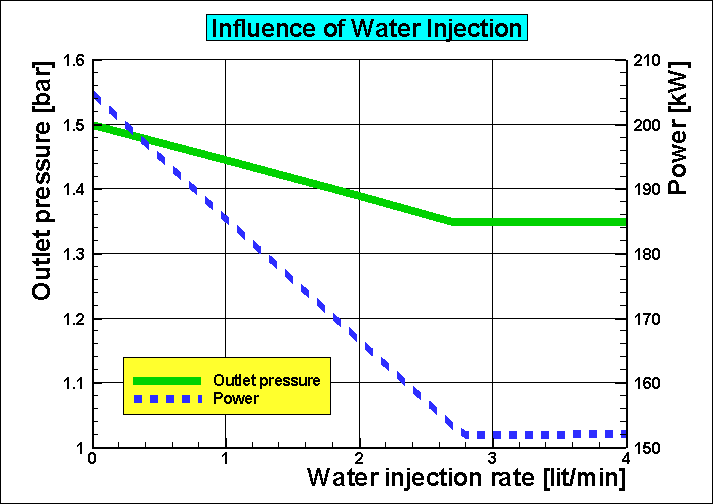 Influence of water injection on outlet parameters after a radial supercharger. 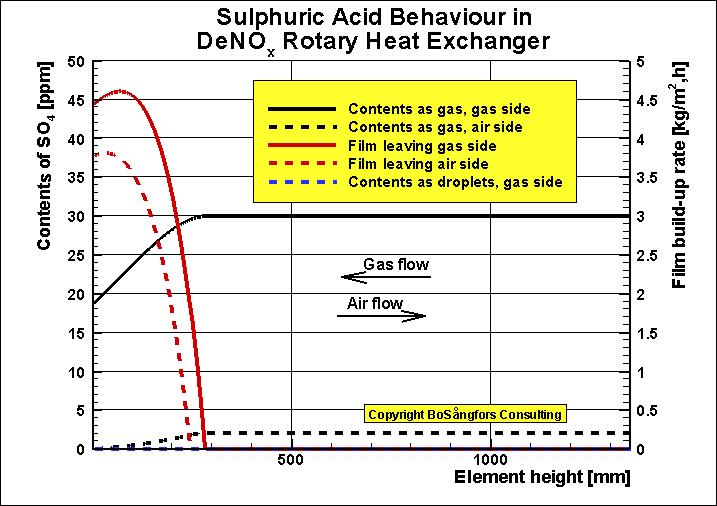 NOTE: When the flue gas contains for instance sulphuric acid it is necessary to start with high excess air. By doing that you get a smaller concentration of sulphuric acid in the flue gas and a lower condensation temperature. 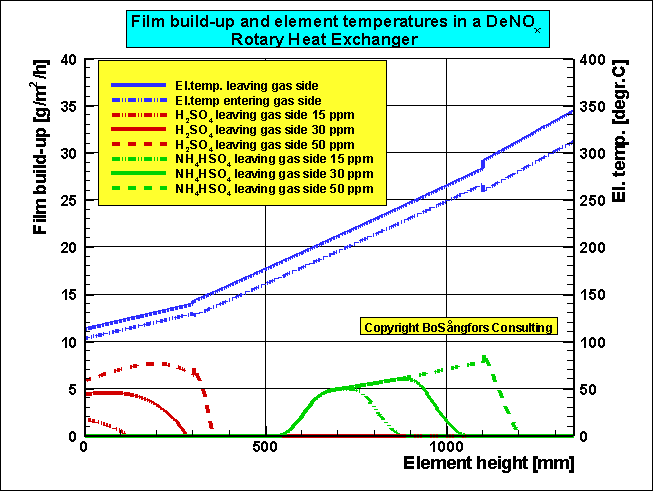 Then you avoid condensation deep into the heat transfer elements. 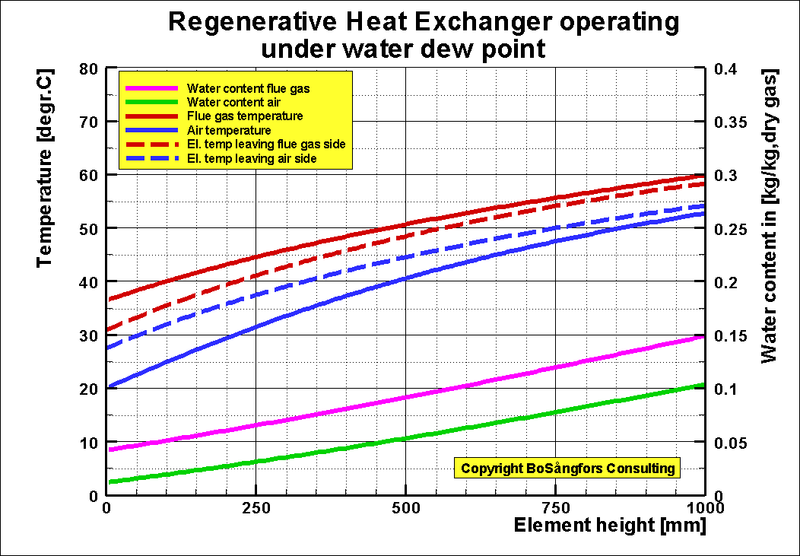 Temperatures and Water content in Regenerative resp. 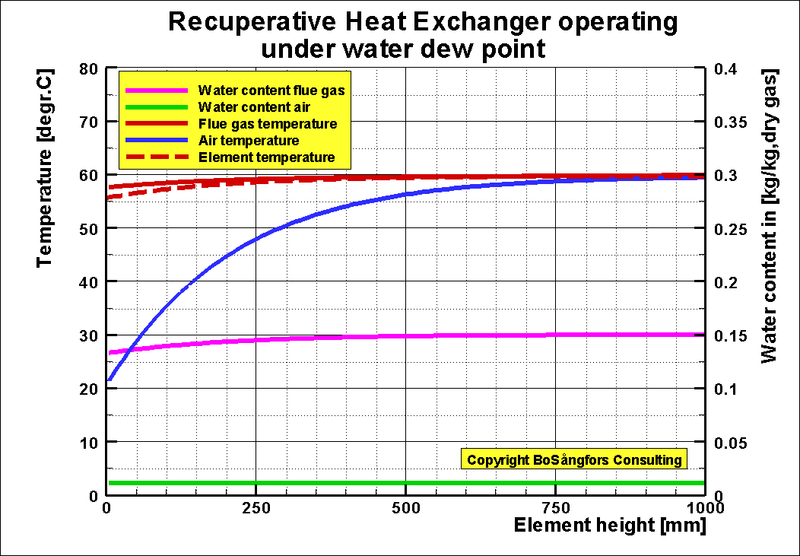 Recuperative Heat Exchanger operating under water dew point. Inlet condition = Flue gas with water spray injection. 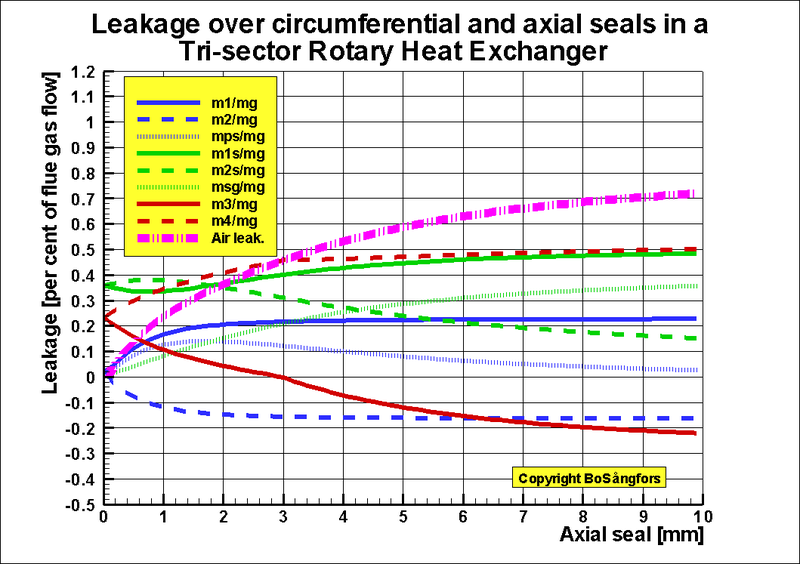 Leakage analysis of a Tri-sector Rotary Heat Exchanger. Air sector primary = 30 degree. Air sector secondary = 150 degree. Gas sector = 180 degree. 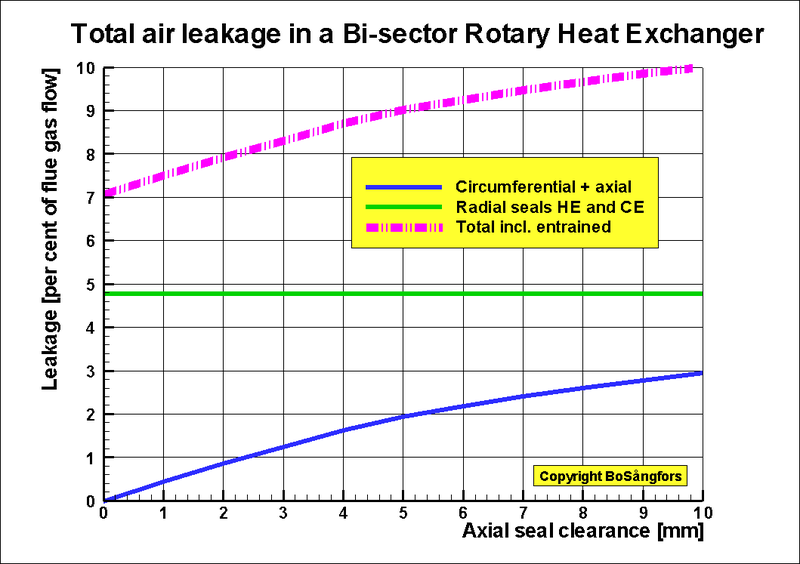 Leakage analysis of a Bi-sector Rotary Heat Exchanger. Air sector = 180 degree. 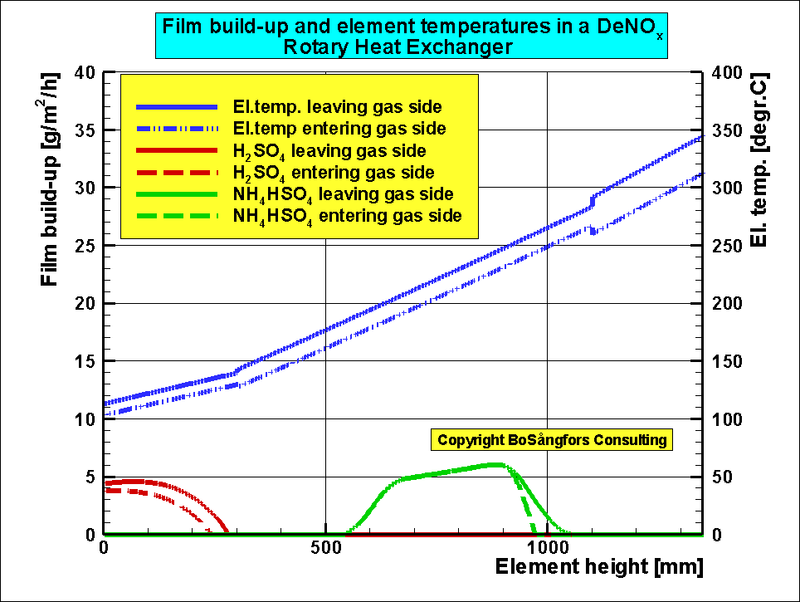 Calculation of Temperatures and Film Build-up in a DeNOx Heat Exchanger. 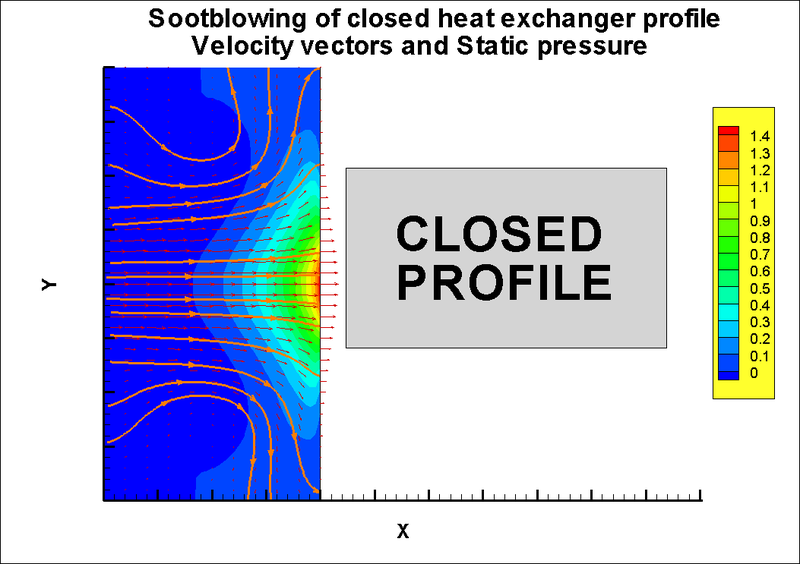 Sootblowing of open and closed element profiles for Heat Exchangers. 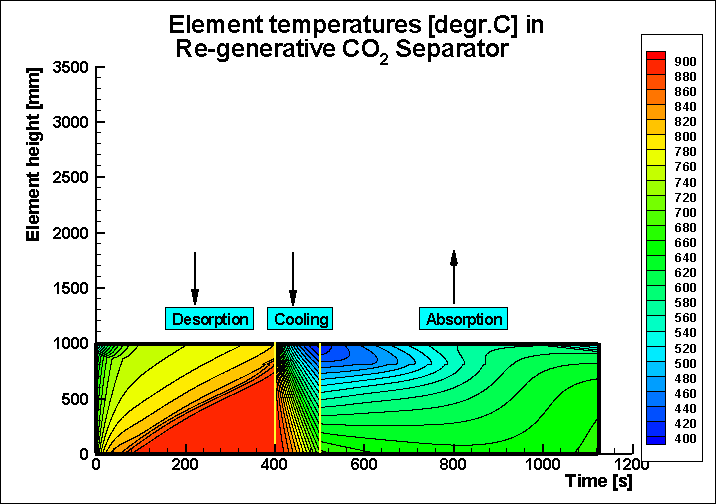 Calculation of Temperatures in a CrossFlowHeat Exchanger.